I thought I would share another Christmas vignette in my house. My MIL gifted me this old world Santa a few years ago. I am not into primitive decor but I absolutely love old world Santa’s. I think it has something to do with the wood and distressed look. As of right now I only have this one but I am eager to find some more. Below my old world Santa hangs all of our stockings. I still have one left to make but that may not happen this year. You may have noticed there are 6 stockings and only 5 in our family. I have decided to start hanging a stocking for Faolan every year. I enjoy finding little ways to incorporate his memory into our special events. I am onto tag #11 at the 12 Tags of Christmas over at The Funkie Junkie sponsored by The Funkie Junkie Boutique. My tag took a very different turn but I still drew inspiration from Linda’s tag. I really liked her trim around the center of the tag, the bow and the center focal point. I started by picking out a tag base that was never used, from my stash. I reworked it by adding a few layers of Distress paint and some color spray. Next, I added a circle stamp in gold and some dyed vintage lace trims to the center of the tag. 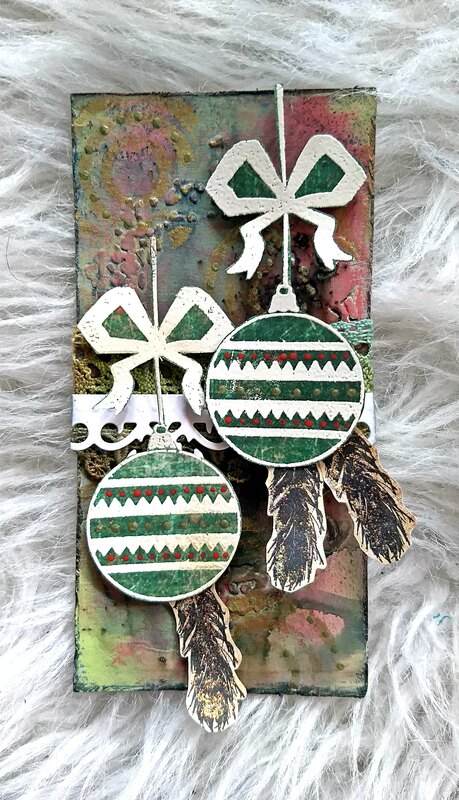 For the center focal point I stamped and embossed ornaments from The Artistic Stamper. The color on the ornaments was created by dipping the wrong end of my paint brush in paint. I added feathers to the ornaments to give a more boho look. I was most impressed with the stockings hanging in a row along the sofa table. I think that is brilliant. I would love to imitate that look, but have no couch in my living space. Your tag is both subtle, yet bold. I know that sounds like a contradiction, but I like the subtle, muted colors and the bold style and layers. I especially like the crisp embossing. It’s genuinely awesome. I forgot to mention how much I like that Santa, too. I have a couple that are similar in design, but mine are both ceramic (or something breakable!). A really WONDERFUL tag and such beautiful decoration for Christmas you have! I am thrilled about the old world Santa! Happy time before Christmas dear Kate! I love the old world Santas as well- I have a few myself! Beautiful tag! Wonderful background and layering! Love your old world Santa,lovely Christmas decor! A beautiful and delightful tag, dear Kate. And oh, isn’t your home simply lovely for Christmas! Happy weekend to you! Oh, that’s a lovely take on Linda’s inspiration – the baubles are beautiful against the many-coloured background. So nice to see a corner of your Christmas home too. I love the ornaments on this tag! They are stunning. Thank you for joining us at The Merry Christmas Blog this week! I love your old world Santa and your handmade stockings. Your tag is very festive. I love the boho touch with the feathers! What a beautiful Christmas decoration!!!!! Lovely tag!!! Love the tag!!! The colours are stunning. And that background is amazing. Thanks for joining us at The Artistic Stamper. I am in love with your design! I can see where you drew inspiration from that old world Santa in the deep rich colors of the background and vintage lace! Love those baubles! What a treat to see this and your lovely photos. Thank you for sharing that part of your home! Glorious decorations! Our stockings don’t go up ’til Christmas Eve; they are a mismatched group, and I guess I should have put more thought into getting them all to look good together. I made my husband’s when we first married (counted cross stitch), my MIL bought my kids their’s when they were babies, (also cross stitched, but different colors) and we also got our new babies stockings. And I had mine from before marriage. I finally got two to match for hubby and me, but my kids didn’t want to change their’s out. I hope you had a joyous Christmas! Hugs! Oh my, Kate, this is fantastic. I think it’s my favorite so far! – gorgeous mixed media background. The ornaments are beautifula and the feathers are the perfect finishing touch! I hope you ad your family had a wonderful Christmas!